A reflectance confocal scanning laser microscope (rCSLM) operating at 488-nm wavelength imaged three types of optical phantoms: (1) 100-nm-dia. polystyrene microspheres in gel at 2% volume fraction, (2) solid polyurethane phantoms (INO BiomimicTM), and (3) common reflectance standards (SpectralonTM). The noninvasive method measured the exponential decay of reflected signal as the focus (zf) moved deeper into the material. The two experimental values, the attenuation coefficient μ and the pre-exponential factor ρ, were mapped into the material optical scattering properties, the scattering coefficient μs and the anisotropy of scattering g. Results show that μs varies as 58, 8–24, and 130–200 cm-1 for phantom types (1), (2) and (3), respectively. The g varies as 0.112, 0.53–0.67, and 0.003–0.26, respectively. D. S. Gareau, Ph.D. thesis dissertation, “In vivo confocal microscopy in turbid media” (Oregon Health & Science University, 2006). S. L. Jacques, D. Levitz, R. Samatham, D. S. Gareau, N. Choudhury, and F. Truffer, “Light scattering in confocal reflectance microscopy,” in Biomedical Applications of Light Scattering, A. Wax and V. Backman, eds. (McGraw-Hill, 2010). R. Samatham, S. L. Jacques, and P. Campagnola, “Optical properties of mutant versus wild-type mouse skin measured by reflectance-mode confocal scanning laser microscopy (rCSLM),” J. Biomed. Opt. 13(4), 041309 (2008). D. Levitz, M. T. Hinds, N. Choudhury, N. T. Tran, S. R. Hanson, and S. L. Jacques, “Quantitative characterization of developing collagen gels using optical coherence tomography,” J. Biomed. Opt. 15(2), 026019 (2010). D. Levitz, M. T. Hinds, A. Ardeshiri, S. R. Hanson, and S. L. Jacques, “Non-destructive label-free monitoring of collagen gel remodeling using optical coherence tomography,” Biomaterials 31(32), 8210–8217 (2010). R. Samatham, K. G. Phillips, and S. L. Jacques, “Assessment of optical clearing agents using reflectance-mode confocal scanning laser microscopy,” J. Innovative Opt. Health Sci. 03(03), 183–188 (2010). S. L. Jacques, “The fractal nature of light scattering,” J. Innovative Opt. Health Sci. 04(01), 1–7 (2011). R. A. McLaughlin, L. Scolaro, P. Robbins, C. Saunders, S. L. Jacques, and D. D. Sampson, “Parametric imaging of cancer with optical coherence tomography,” J. Biomed. Opt. 15(4), 046029 (2010). L. Scolaro, R. A. McLaughlin, B. R. Klyen, B. A. Wood, P. D. Robbins, C. M. Saunders, S. L. Jacques, and D. D. Sampson, “Parametric imaging of the local attenuation coefficient in human axillary lymph nodes assessed using optical coherence tomography,” Biomed. Opt. Express 3(2), 366–379 (2012). 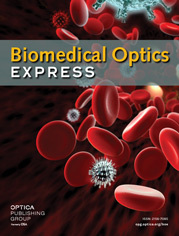 INO, Inc., “Biomimic—optical phantoms,” (2012), http://www.ino.ca/en-ca/achievements/description/project-p/optical-phantoms.html . Fig. 2 Schematic of the reflectance confocal scanning laser microscope (rCSLM). Laser light is delivered to a focal volume within the phantom, and reflectance from this focus is returned through a pinhole to a detector. The sample stage moves the phantom up and down in order to scan the focus within the phantom. Fig. 3 Side-view confocal reflectance image in volts, image(z,x) at y = middle of 3D image. The images show log10(voltage), where voltage encodes the reflectance. The color code is black = 0.01 V and white = 10 V. The axial stepsize, Δz, was 1 μm. The microspheres have a glass/gel interface, while others have a water/phantom interface. Fig. 4 Calibration of confocal reflectance measurement at 488 nm wavelength, using glass-water(gel) interface. Subsequent measurements of phantom are multiplied by calib (1.204x10-4 V-1) such that a measurement of a glass-water interface will yield Rglass-water = 0.00427 and measurement of a mirror will yield Rglass-water = 1. Fig. 5 Axial profile of confocal reflectance versus depth of focus, R(zf). The reflectance from the glass-gel interface was assumed to match the specular reflectance of a glass-water interface, Rglass-water = 0.00427, and was used to scale the laboratory counts. Hence, R(zf) is calibrated such that reflectance from a mirror in the focus yields R = 1. The exponential red line is R(zf) = ρ exp(–μ zf). The value ρ is the extrapolated red line value at zf = 0. The value μ is specified by the slope. Fig. 6 Calibration grid with experimental data (red circle) and the Mie theory prediction (black diamond) using Eqs. (3), (4) for the polystyrene microsphere gel of Fig. 5. Mie theory predicts μs = 58.2 cm-1, g = 0.129, and Eqs. (3), (4) predict μMIE, = 131 cm‑1, ρMIE = 8.2x10-4. The experiment presents μ = 130 cm‑1, ρ = 9.2x10-4, and μs = 57.7 cm-1, g = 0.072. Fig. 7 Sampling of 15 axial profiles for the phantoms. The polyurethane phantoms have a baseline of low reflectance at the noise level of the measurement, but there are occasional spikes of reflectance from local strong reflectors. Bold red lines are exponential fits to the data, which is extrapolated to the front surface, indicated by red symbol. Fig. 8 Experimental attenuation vs reflectivity for phantoms at 488 nm wavelength, based on exponential fits of axial profiles (red lines in Fig. 7). The experimental measurement on polystyrene microspheres and the prediction of Mie theory are closely aligned. (5) a(g)=1−exp( − ( 1−g ) 0.6651 0.1555 ).